Saban's Go Go Power Rangers series has all been building to this, and the culmination of several ongoing plotlines come to a head in a one-shot from BOOM! 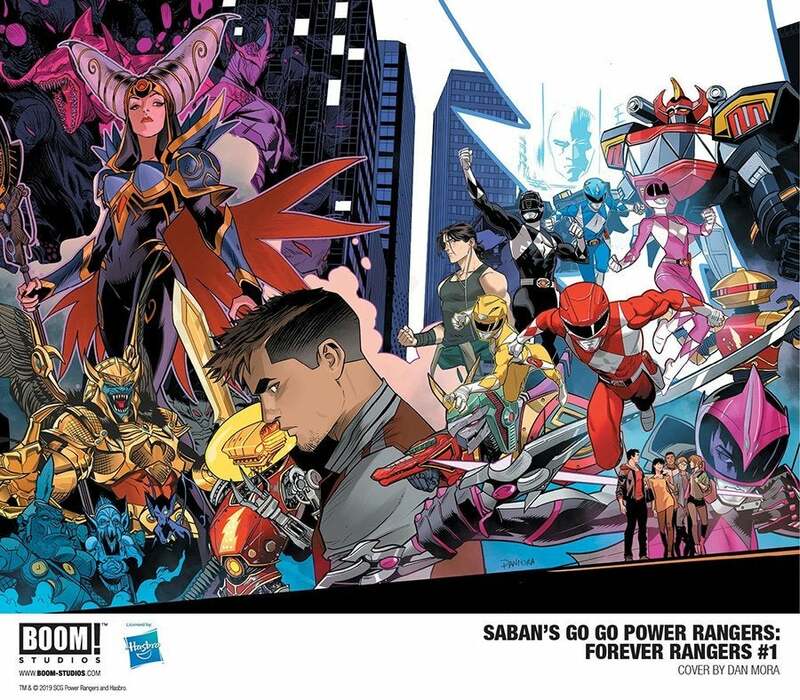 Studios titled Saban's Go Go Power Rangers: Forever Rangers #1. The new oversized special will be written by the regular creative team Ryan Parrott and Eleonora Carlini and Francesco Mortarino, and will focus on the Rangers battling someone they thought was their ally in Alpha One, but the stakes are much higher than just defeating the latest villain. As revealed in the official description below, Alpha One is seeking out revenge against Zordon, and he has no issue with destroying Angel Grove in the process. Not only that but if you take a look at the cover you'll see Rita Repulsa looking on, who's been attempting to repower the Dragon Power Coin. We also see Matt on the cover, so his story might also be getting some attention, and we can't help but notice Ranger Slayer is also there, so maybe she will have some sort of part to play. The book's cover will be created by Dan Mora, and as you might expect is simply gorgeous (make this a poster please!). You can check out the full cover and the book's description below. "Is this the end? Alpha One is bent on revenge against Zordon, his creator, and willing to destroy anyone who may stand in his way, including the Power Rangers! They summon every last bit of morphin power they’ve got to halt the deranged robot on his path of destruction and death. But when it looks as though their combined strength might not be enough to stop the murderous and hyper-charged Alpha One from laying waste to Angel Grove, the Power Rangers must reach deep and ask themselves just how far they are willing to go to save Zordon, Angel Grove, and the rest of humanity from Alpha One’s plans." Saban's Go Go Power Rangers: Forever Rangers #1 lands in comic stores on June 19th. If you need to get caught up on the Power Rangers comics and Go Go in particular, you can check out our handy guide right here! You can also hit me up @MattMuellerCB for everything Power Rangers!